Fit your home with some of the finest sliding doors Barnsley has to offer by calling Clear View today on 0800 1357167. 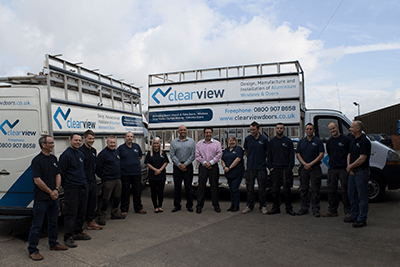 Established in 2010, Clear View has been designing, manufacturing and installing doors, windows, orangeries and roof systems for nearly a decade. We’d be more than happy to discuss your ideas and requirements in person, so call us today to arrange a friendly chat. There is much to be said for the beauty and splendour often associated with a set of sliding doors designed and constructed by a team of knowledgeable professionals. At Clear View, we know what ‘quality’ looks like, so you can always be certain of who to call when it comes to sliding doors Barnsley will be impressed by. Sliding doors have always been a popular choice and are a great alternative to folding, patio or French doors. In the past, we’ve even heard some of our customers remark that having a set of sliding doors is like having a sliding glass wall. The compact design means there won’t be any obstruction created by an open door. Once opened, you’ll have unhindered access to your garden, and the large glass windows allow for plenty of light to enter your home. When compared to a bi-folding door, a sliding door actually lets in more light as there are far fewer vertical panels which can obstruct the flow of light. But that’s not all, at Clear View, we supply Barnsley sliding doors that yield many more fantastic benefits. You can read more about these below. First, sliding doors are incredibly energy efficient able to insulate an entire room, thereby, maintaining the internal temperature and lowering those pesky energy bills. They sport shatter-proof glass making them far safer than sliding doors in years gone by. The best sliding doors Barnsley has to offer also happen to be the most secure option for your home too. Many sliding doors feature incorporated gaskets, aluminium seals and fixed leaves which help to reinforce the doors preventing intruders from entering your home. Sliding doors in Barnsley provide unobstructed views of your garden which makes them ideal for parents looking to keep an eye on their kids. They are stylish, feature outstanding glazing options, let in plenty of natural light and are a great space-saving option. To start with, it’s worth noting that despite the large glazed areas, most of which can weigh in excess of 180kg, sliding doors are actually a rather elegant choice. Far from cumbersome, they are remarkably easy to open and close requiring very little effort on your part. We’ve designed the quietest, most efficient sliding doors Barnsley has seen. These doors will open and close in almost virtual silence. There are several different panel combinations available, and we can discuss this with you during our consultation. Your choice can also impact other factors too. For instance, a twin-track sliding system is usually installed if a two or four-door panel option is requested. Triple track options are available for three or six-door panel options. 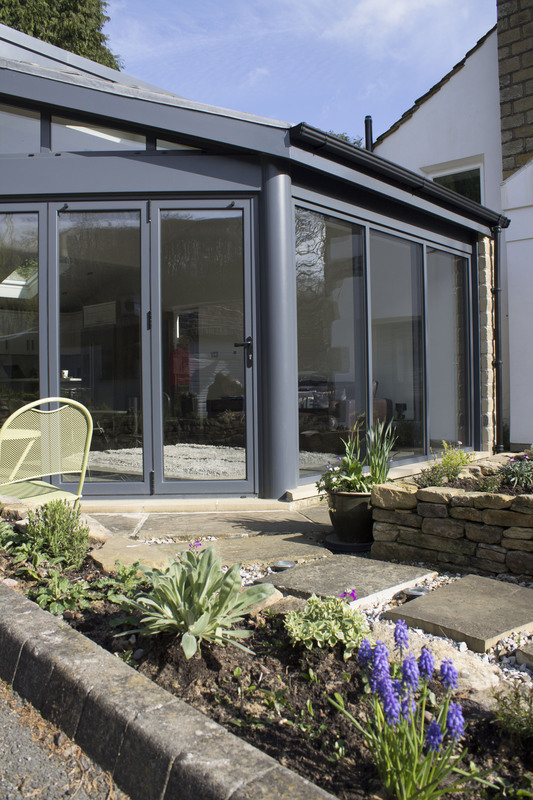 Depending on the option chosen, a clear opening of between 66% and 75% can be established for your sliding doors Barnsley. All measurements are typically taken by a member of our team as this helps to minimise the risk of any errors occurring. Should an error occur, we are able to assume full accountability for this providing you with complete peace of mind. You’ll be supplied with a fully itemised quotation at the conclusion of the inquiry stage, and should you wish to proceed, we’ll begin the process of designing and manufacturing your doors. We manufacture all sliding doors in Barnsley in our state-of-the-art facilities. This enables us to maintain the highest levels of quality across the board and to ensure that your new doors are manufactured in accordance with your schedule. Once fabricated, we’ll transport the doors to your premises where our team will oversee their installation. 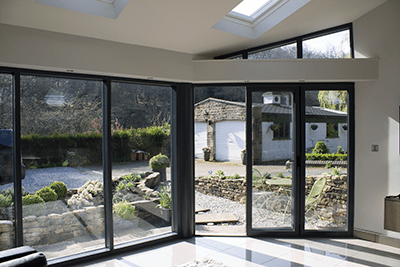 Why Choose Clear View for Sliding Doors, Barnsley? Here at Clear View, our reputation precedes us. It is the main reason why we are so highly sought-after by customers looking to add quality doors, windows, roof systems and orangeries to their homes. With nearly ten years’ experience, we supply Barnsley sliding doors which are second-to-none. These are made using high-quality materials by our creative design team, and every product comes with a full guarantee. We never use subcontractors, and our team are all fully insured for your added peace of mind. Whatever you require from us, you can be confident that we’ll deliver. As well as quality products, we also pride ourselves on offering outstanding workmanship and the most affordable prices around. So, if you’re in the market for a new set of sliding doors, look no further than Clear View. Discover the finest sliding doors Barnsley has to offer when you call Clear View today on 0800 1357167.